A lively and intense color, orange labels make anything pop. You can use orange labels for home organization. Label jars in the kitchen, baskets in the entry-way, boxes in the kids’ rooms, important files in the office, and storage items in the basement. Orange labels can also be used to send noticeable mail. Stick one on a basic white envelope to give it a dash of excitement. Or add one to an already bright envelope for truly colorful mail, maybe even a black envelope for the perfect Halloween theme. Whatever you choose to do with these labels, you and your recipients will easily take notice. 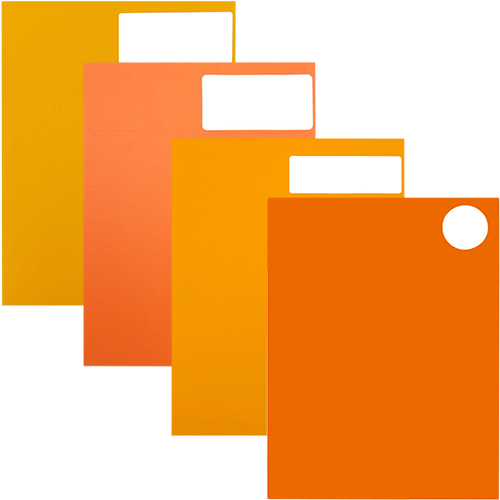 Orange labels come in packs of 120, 126, 50, or 10. Available in 1 x 2 5/8, 1 1/3 x 4, 2 x 4, 4 x 3 1/3, 4 x 5, 1, 5 1/2 x 8 1/2, 2/3 inch Circle, 2 1/2 inch Circle, 2 x 2 Square, and 8 1/2 x 11 (Full Page). In either Orange, Neon Orange, or Orbit Orange. They work for most printers so you can easily create a label worth reading!